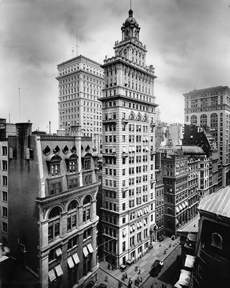 These images highlight the successive buildings that occupied the northwest corner of Wall and Nassau streets. Reproduced from digital files, Library of Congress. Reproduced from digital file, American Newspaper Repository, Duke University Libraries. 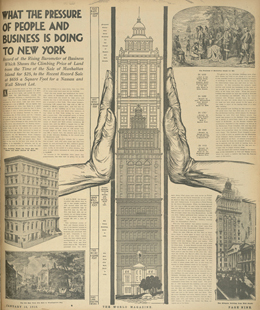 A reproduced page from the popular newspaper The World for Sunday, January 16, 1910, describes "the romance of real estate" that drove land prices on Wall Street, as well as new buildings, to dramatic heights. 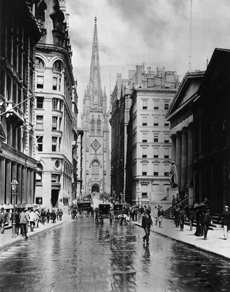 The paper noted that the value of land had increased from $56,000 in 1850 to $1.2 million in 1910. 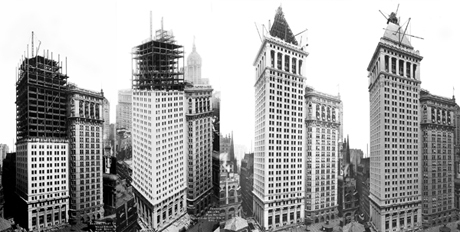 A series of photographs charts construction progress on the Bankers Trust tower from May to August 1911. The steel frame is shown rising in the first photograph and near completion in the last, with the stone pyramid approaching its full height of 538 feet. Reproduced from the original certificate in the collection of Mark Tomasko. 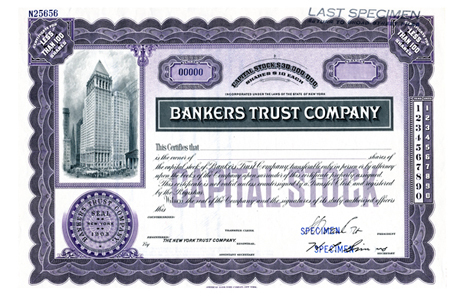 The specimen stock certificate for the Bankers Trust Company features a fine engraved image of the "Tower of Strength," seen after the addition of its annex building, designed by architects Shreve, Lamb & Harmon and completed in 1933.